Meyer's Parrot (Poicephalus meyeri) populations are declining due to habitat destruction, persecution and heavy trapping for the wild bird trade. 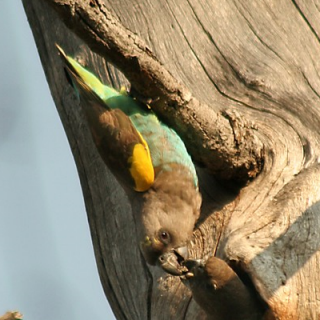 Project progress: Starting in 2004 and carrying through to 2008, the World Parrot Trust funded a number of studies for Meyer’s Parrot, including one with Dr. Steve Boyes, who studied its niche specialist qualities - research that is potentially useful for the conservation of other at-risk Poicephalus species in Africa. Outcomes: Recent surveys have shown this species has a wider range than previously thought in some areas to the north and west; conversely, other areas show a near-disappearance. More research is needed, as it will lead to a conservation plan for the Meyer's and the more threatened parrots, and special reproductive aids for them such as nest boxes for breeding. Where found: P.m meyeri: NE Cameroon through S Chad east to S Sudan, W Ethiopia and SW Eritrea. P.m. transvaalensis: S Zambia and N Mocambique through Zimbabwe to NE Botswana and south to Transvaal, NE Republic of S Africa. P.m. damarensis: NW Botswana, west to C Namibia and S Angola. P.m. reichenowi: N and C Angola and SW Democratic Republic of Congo. P.m. matschiei: SE Democratic Republic of Congo, C and N Zambia, N Malawi and SW Tanzania. P.m. saturatus: W Tanzania, through Burundi, Rwanda and E Democratic Republic of Congo to Uganda and C Kenya, east to Meru. History: Meyer’s Parrot, Poicephalus meyeri, is listed as a CITES II species, and is not considered globally threatened. In spite of this, numbers in northern South Africa and parts of Zimbabwe have been considerably reduced by habitat destruction and human-animal conflict. This species has also been heavily traded: since 1981, 75,387 wild-caught individuals have been recorded in international trade (UNEP-WCMC CITES Trade Database, January 2005). These human-parrot interactions are escalating. Ecology: The Meyer’s Parrot is found in most parts of Africa in a variety of woodlands: dry savanna, gallery and riparian areas, secondary growth and some cultivated fields up to an elevaton of 2200m (7216 ft). They eat fruits, nuts and seeds, along with a few legumes. Occasionally they can be seen foraging on grain and insects. They are occasionally found in suburban areas. Bird are seen in pairs or groups of up to 50 birds at food sources, where they spend the day before roosting in tree cavities for the night.